Can I delete multiple songs/playlists from my iPhone at a time? Yes, just read this post to make it with or without iTunes. Download AnyTrans to help you easily remove multiple songs from iPhone, no matter it is old iPhone 3/4s/5s or the newest iPhone 8 (Plus)/X. Also supports various of iPad, iPod. Getting rid of some playlists that you don't interested in or some useless duplicate songs on iPhone music app is one good way to free up the limited storage of your devices. 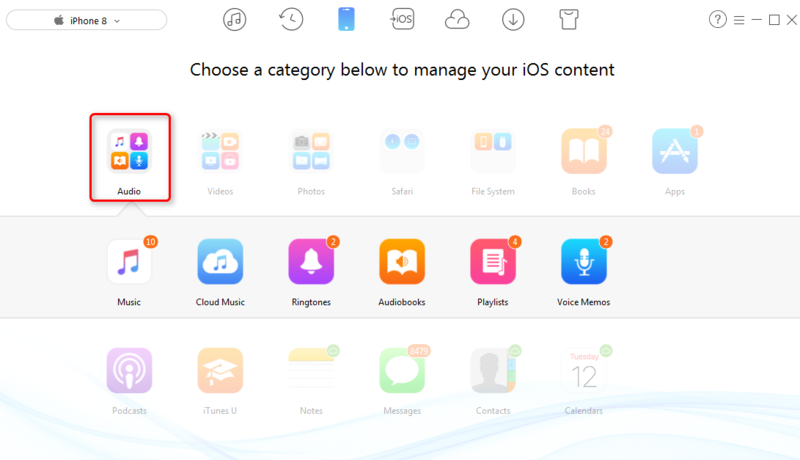 However if you have tried to delete music on iPhone/iPad, you would find that you have to delete songs one by one, which is a little difficult - especially when you have so many songs you plan to get rid of. So is there some simple way to make it? Actually, there is no easy way that Apple provided for you to directly 1-click remove multiple songs from iPhone on its Music app. If you want to delete more than one song or one playlist at a time, you have to use iTunes or some iTunes alternatives. So in this post, we provide two methods below to help you make it. If you have no iTunes library on your computer, you can use third-part software – AnyTrans, to manage your iOS devices on computer and get rid of multiple songs at once, which is simple and quick. 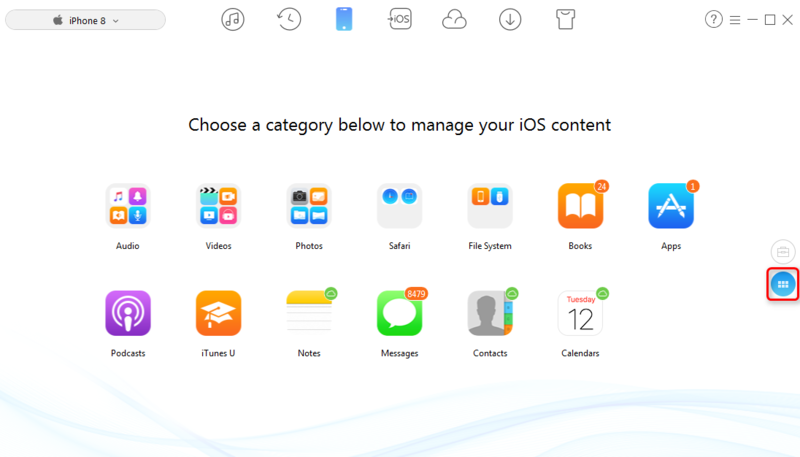 With this tool, you can even selectively delete songs, messages, notes, contacts and other 10+ types of files on your iPhone/iPad. Now, download AnyTrans and follow the steps below to delete the items you don’t want. Step 1. Install and run AnyTrans on computer. Connect your device to computer by using USB cable. Step 2. AnyTrans would scan your iPhone automatically. Then go to the category management page by scrolling down or click the button. Step 4. 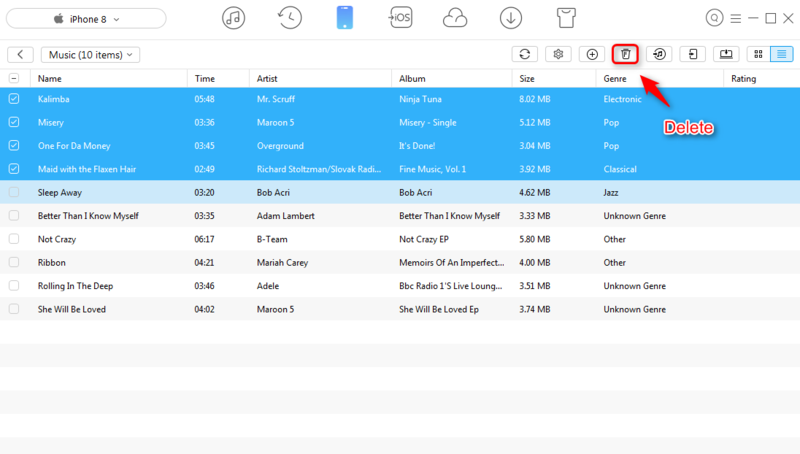 Select the Songs you want to remove, click the "Delete" button and you can get rid of them once for all. Note: this method won't erase any songs on your iTunes on computer. If you always keep your Music app files in sync with your iTunes on computer, you can use this method to remove unwanted songs. It is simple, but you’ll lose the songs on both your iTunes and iOS devices. Step 1. Open iTunes on computer > multi-select unwanted songs > delete the songs. Step 2. Sync songs to your iOS devices. Removing iOS devices’ songs by using iTunes or AnyTrans could be easier than deleting them one by one on your devices. And if you want to delete some other items, such as contacts and messages, you can also use the methods above to help yourself.